Helaine Blumenfeld OBE is one of the most accomplished and respected figures working in sculpture today. Blumenfeld has developed a practice inspired by Cycladic sculpture and Futurism, creating a sculptural vocabulary that is entirely her own. Excelling in a male dominated field, Blumenfeld exhibited alongside Henry Moore at the Alex Rosenberg Gallery in New York in 1985, and became the first female sculptor to win the international sculpture prize 'Premio Pietrasantaela Versilianel Mondo' in 2007. Best known for her monumental public commissions, Blumenfeld is passionate about bringing sculpture into the public domain, creating works that have become intergral to the cultural landscape in the UK. Most notably, 'Tempesta' overlooking Hyde Park in London, installed in 2012 and ‘Fortuna’ in Canary Wharf in 2016. Blumenfeld's pieces represent some of the definitive examples of public sculpture in the UK. Helaine Blumenfeld's facility at positioning her sculpture in the magical zone between abstraction and figuration has been the key to her success. Her luminous works play with duality, introducing a remarkable lightness to carved stone. Testing the limits of her material, Blumenfeld creates impossibly thin, undulating structures through a profound understanding of the boundaries of her materials. Recent pieces have seen her expand her practice to experiment with Silver Nitrate patinas- a nod to her father- in- law, the acclaimed photographer Erwin Blumenfeld. 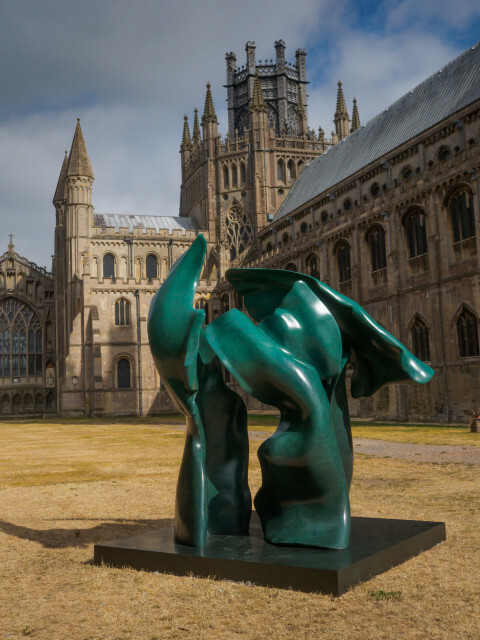 Sky Arts premiered the documentary 'Hard Beauty: Helaine Blumenfeld' in April 2018. This personal portrait includes Timothy Potts, Director of Getty discussing Blumenfeld's work and sheds light on the latest and greatest developments in her remarkable career, including the installation of her work in the permanent collection of the Victoria & Albert Museum and the creation of ‘Tree of Life’ commissioned by The Woolf Institute and unveiled by The Princess Royal. Since the film was created, Blumenfeld was commissioned to create a 1m high marble for the new St Regis Hotel in Hong Kong, designed by Andre Fu, together with two monumental bronzes for the entrance of the new Bellagio in Shanghai. In November 2018, Blumenfeld's 5m high bronze was unveiled at Jaddaf Waterfront Sculpture Park at the new Jameel Arts Centre, Dubai. In 2019 Blumenfeld will be exhibiting at Pilane Sculpture Park, Sweden and Huygens Hofwijck Museum in The Netherlands.